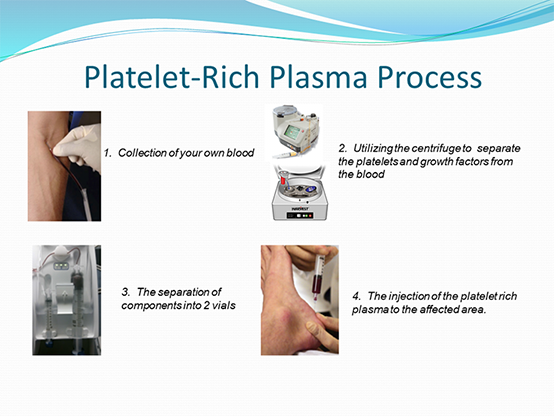 Platelet-Rich Plasma involves taking blood out, centrifuging it down from Arthrex Angel Technologies and/or Harvest (Ternmo) and using the plasma which has concentrated platelets for healing. The PRP concentration of platelets is 5-6x that of regular blood. It was first reported used in the late 1980s by cardiovascular surgeons. Later use included ENT and dental specialists for periodontal post-surgical healing. Burn surgeons used it to promote better wound healing. It then made its way to orthopaedic surgeons for bone and tendon healing. Clinical trials have been published showing successful use in chronic tennis elbow (Peerbooms JC et.al Am J Sports Med 2010;38:255-62) and smaller positive trials for plantar fasciitis, rotator cuff partial tears, knee ligament tears (see review paper Nguyen RT et.al. PM&R 2011;3:226-250). Over the past few years, its use has become well publicized in professional athletes. Even racehorses at Woodbine racetrack are getting this. It is now becoming more popular as a way to heal chronic injuries and chronic pain long-term (as opposed to relying on pain-killers and anti-inflammatories that suppress symptoms). At CCIM, we specialize in safe, comfortable and accurate injections (ultrasound guidance) using a team approach that incorporates PRP in the overall rehabilitation process to greater quality of life and return to work and/or sport. Our experience show great success in treating areas with much ligamentous structure...such as the sacroiliac joints of the low back. FCAMT physiotherapist Mark Tsai assisting Dr. Ko doing PRP. 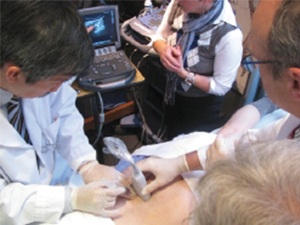 Ultrasound-guided platelet-rich plasma therapy for back pain.